This is another great "before and after" landscaping project. 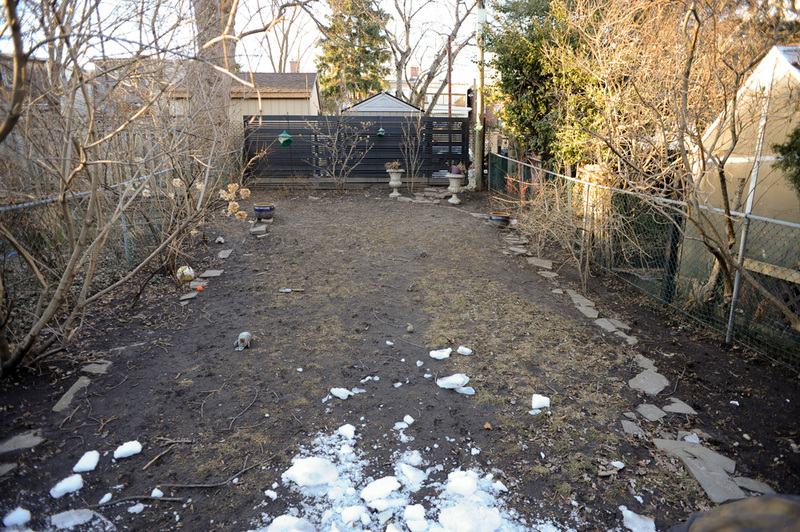 This Leslieville backyard was originally sloped up to the back fence, and wasn't the most functional space. A large tree in the corner of the property made it difficult for sod to thrive, resulting in a rather mucky mess. For this project we excavated out the slope of the yard, and levelled an area for a natural stone patio. 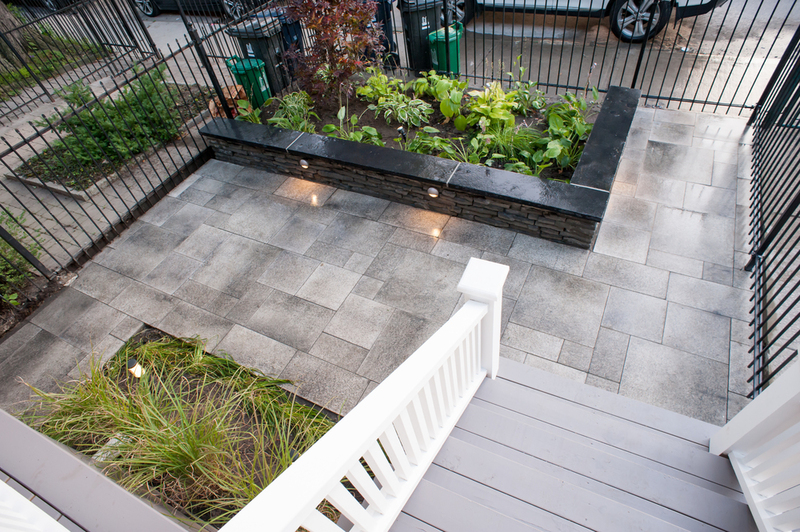 We cleaned up and edged in the gardens, and installed a retaining wall with steps leading up to the back laneway. We installed up lights in all three garden beds to illuminate the tree and larger shrubs, which gives the project more depth and a lovely atmosphere when viewed at night from the kitchen window. We also installed drip irrigation to the garden beds, and step lights on the deck, although you can't see them in the photos below. Patio - Banas square cut 'Kota Black' flagstone. While it was a fairly straight forward project, our main challenge was the limited access we had to the back yard. The project required the removal of almost 40 cu. yards of excavation to get the yard to the grade we needed for our base. 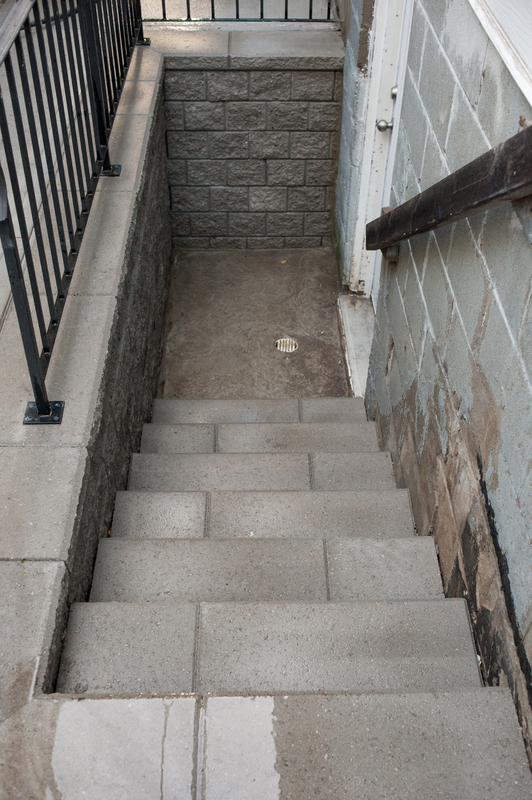 As is typical with many Leslieville properties our access down the side of the house was very narrow (31"), considering the amount of fill we had to remove we knew this would be a big challenge. To assist us and keep things moving swiftly on site, we brought in a Cormidi Mini Track Dumper which we used to fill a bin in the front yard (photos in slideshow below).